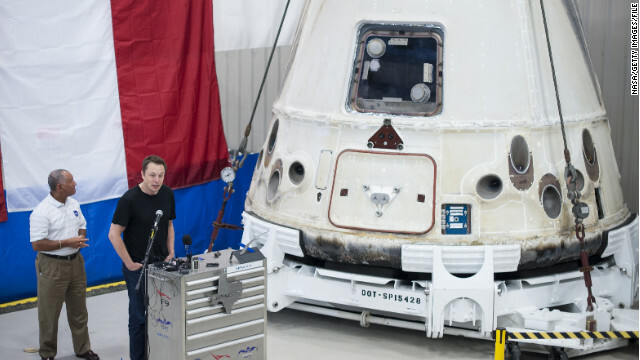 NASA'S Charles Bolden, left, and SpaceX CEO Elon Musk stand next to the Dragon capsule in June in McGregor, Texas. The SpaceX Dragon has splashed down in the Pacific Ocean after a three-week flight to the International Space Station, completing the first commercial cargo mission to Earth's orbit, NASA announced Sunday. The unmanned capsule came down about 250 miles west of Baja California at 3:22 p.m., the space agency reported. The craft was launched October 7, the first of a dozen flights to the space station planned under a contract with NASA. The craft carried nearly 900 pounds of supplies to the station and returned with nearly 1,700 pounds of freight, mostly used hardware and scientific research material. The reusable craft has been loaded onto a ship and was carried back to shore Sunday afternoon, SpaceX said.